Love food and travel? Plan your 2018 with a culture-rich food events from around the world that you must try. With ten options that you can plan with, enjoy great food and drinks held around the world. Taste of the South at Blackberry Farm is held in Walland, Tennessee during January each year. A much-anticipated start to the Blackberry Year, Taste of the South is the annual celebration of Southern food traditions – and the ways the cuisine continues to evolve. This epic three-day event, featuring the Fellowship of Southern Farmers, Artisans and Chefs and benefitting the Southern Foodways Alliance, includes a dazzling mix of demonstrations, tastings and teachings to delight the palate. Beyond incredible food, you’ll enjoy delicious wine and the unique perspective of some of the most important voices of today’s food world. The Taste of Tasmania is held year end in Tasmania, Australia. Enjoy world class seafood, beers and wines, cheese and berries during the festive summer time. The event celebrates Tasmanian food, beverages, creative talent and the Tasmanian relaxed and family-friendly lifestyle. Held on Hobart’s stunning waterfront, the event showcases around 70 stallholders from all around the state, from local restaurateurs to regional and boutique producers. A highlight is the Kids in the Park area on Parliament House Lawns, where free daily programs of sporting activities, art and craft, cooking classes, performances, face painting and a nightly Twilight Cinema keep children of all ages busy. An eclectic, Tasmanian-focused entertainment program includes bands, roving street performers and buskers, while the program also features free cooking demonstrations and ticketed Food Tours and Tasting Table sessions. Good Food and Wine Show will be held in Cape Town in May 2018 and in Johannesburg in July 2018. One of the most popular event held in South Africa, The Good Food and Wine Show has eight separate sections for you to enjoy. These dedicated sections aim to totally encapsulate their respective ideas, and showcase the best goods and services available. There will be areas dedicated to Wellness, Lifestyle, Wine, Market, Beer and Alcohol, Kids, Street Food and Baking. So whatever aspect of food you love, this event provides the perfect experience for you. Famous TV cooks and celebrity chefs are invited for cooking demonstrations. A large number of exhibitors exhibit chocolates for the ardent chocolate lovers, spirits, wines, cooking tools. A great way to know what is new and upcoming in the market, the event is a must for people wanting to expand their recipe knowledge. Cherry Blossom Festival Japan is known around the world for its cherry blossom festivals. Known as hanami in Japanese, cherry blossom festivals are an important custom. In fact, they are held all over Japan during the springtime. Unlike the aristocrats of yesteryear, today people in Japan make fun a key component of cherry blossom viewing. They drink and eat, making the tradition of blossom viewing more like a picnic under the trees. People bring home-cooked meals, make barbecue or buy take-out food to mark the occasion. Montréal en Lumière is held in the beautiful city of Montreal, Quebec. One of the largest winter festivals in the world, an annual celebration registering 1,300,000 festival site visits from fans experiencing the joy of Montréal’s winter through a unique program combining performing arts, gastronomy, free outdoor family activities, and an all-nighter filled with exquisitely original discoveries. You can experience the rich culinary culture in the weeklong festival as Chefs demonstrate incomparable cooking while you enjoy great food. Singapore Food Festival From hawker food and mod-Sin cuisine, to fine wines and open-air cinemas – there’s plenty to check out at the Singapore Food Festival. This event takes place every year from the end of June to the end of July and is organised by the Singapore Tourism Board. Composed of weekly core events, themed celebrations, culinary workshops, and competitions organised island-wide, this month-long festival celebrates the local perennial food favourites that have given Singapore an international reputation of a diverse food heaven. The multi heritage vibe of the city offers the main event STREAT, where you can taste different dishes from all over Singapore. There is no entry charge to STREAT and you only need to pay for the food. Top chefs come together and demonstrate their cooking. Enjoy the exciting traditional cuisine of Singapore. Also experience the country’s culture and opera performances. NYAMJAM Festival at Jamaica pairs famous international celebrity chefs and the local culinary talent. Nyam means “to eat” in Jamaican slang. Chefs, foodies, and music lovers will flock to the small parish of St. Mary for a two-day extravaganza featuring a celebrity chef dinner, a music-and-culinary bazaar, and a whole lot of cocktails. There is also a music and culinary bazaar that you can enjoy, with great DJ performances and different street food stalls. Back in 2015, April Bloomfield, Jose Enrique, Mario Batali, Johnny Iuzzini and Seamus Mullen participated in the inaugural edition, cooked aside island chefs Gariel Ferguson and Colin Hylton. Cherry Bombe Jubilee is held in New York by the indie women- in- food magazine Cherry Bombe. The Jubilee is a day-long conference dedicated to conversation, connections, and, of course, great food and drink. They bring together a wide range of speakers, from industry icons to up-and-comers, and some of the best chefs, bakers, winemakers, indie food producers and more the area has to offer. The magazine started the Jubilee because women were being left out of food conferences taking place around the world and they wanted a day where they could come together, network, make friends, build the community, and discuss the important matters of the day. Cayman Cookout is one of the world’s most treasured celebrations of food and wine, Cayman Cookout welcomes an elite roster of talented chefs, wine and spirit experts and culinary influencers each year. The exclusive, interactive weekend features cooking demonstrations, tastings, tours, dinners, pairings and unique epicurean experiences – all presented in a relaxed Caribbean setting of fun, friendship and barefoot elegance. The annual gathering is set amidst the Cayman Islands’ magnificent Seven Mile Beach and is hosted by world-renowned Chef Eric Ripert and his friends, including Anthony Bourdain and José Andrés. La Tomatina is a festival always held on a Wednesday towards the end of August in the town of Buñol in the Valencia region in Spain. 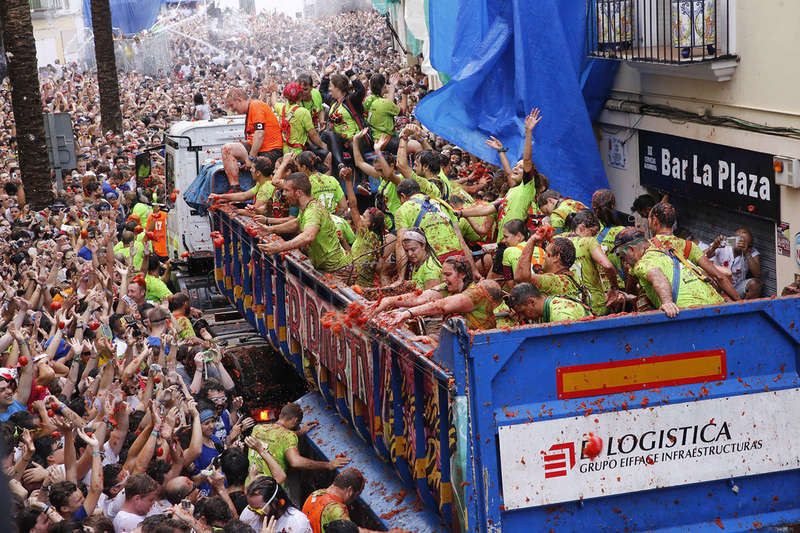 Tens of thousands of participants come from all over the world to fight in a harmless battle where more than one hundred metric tons of over-ripe tomatoes are thrown in the streets. So there you have it. Enjoy interesting food and drink rich wine while you make new friends and make 2018 a year worth remembering.